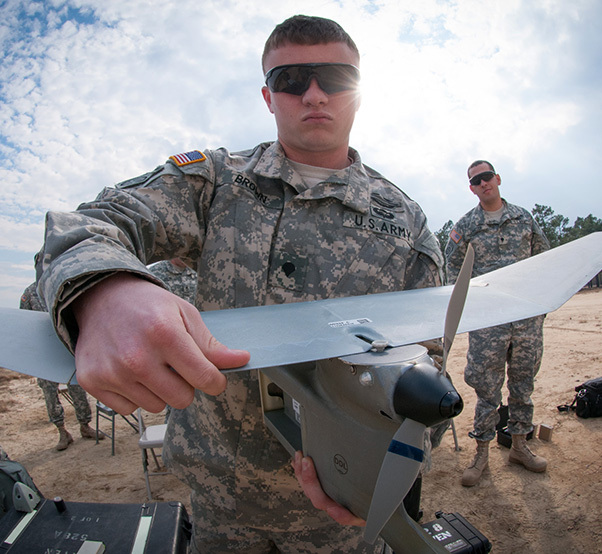 An unmanned aerial vehicle, or UAV, operator, with the 82nd Airborne Division’s 1st Brigade Combat Team, assembles a Raven during a UAV refresher course, on Fort Bragg, N.C., Feb. 5, 2013. The Raven is slightly smaller than the UAVs that infantry units commonly operate in Afghanistan, but the skills to fly them both are the same. That’s what Army Col. Courtney Cote told a gaggle of mostly aviation and aerospace media at the Association of the United States Army Annual Meeting and Exposition, or AUSA, Tuesday. He was talking about unmanned aerial systems – the new player on the battlefield that, Cote asserts, is here to stay. Assigned as the program manager for all Army unmanned aircraft, the colonel exudes an enthusiasm for the capability’s potential, and a realist’s view of the questions and challenges that must be addressed. The bottom line is “the Army’s interest in increasing our lethality,” Cote said, but he acknowledges that the real bottom line — the defense budget — will drive the train. But when asked by a reporter for his view of the future, including his “wish list,” he did not hesitate. 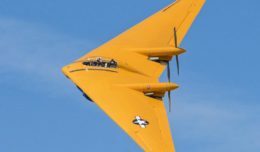 “We want to be scalable and we want universal operator systems with common interface,” he said, pointing to a growing number and variety of unmanned aircraft that are expected to be fielded across some 15 company-sized Army units, including those based on Fort Hood, Texas, Fort Riley, Kansas, and Fort Stewart, Ga.
“Wish list? Anti-jam, integrity of communications links … a system that does more and yet is smaller,” Cote said. He and his boss, Col. Tom Voneschenbach, work off a set of questions that fuel the systems’ continuing development and tweaking.